PayPal Galactic: Buzz Aldrin, SETI announce outer space payments service. PayPal figures they’ll need a way to settle up at the end of their skins game. PayPal brought in astronaut Buzz Aldrin on Thursday to announce the launch of PayPal Galactic, an initiative to figure out a way for people to pay each other while traveling in space or living on other planets. No, it isn’t a joke. And while it may sound like a publicity stunt, both Aldrin and PayPal president David Marcus promised that it’s also a genuine business proposition—albeit one that remains some years away. PayPal’s Marcus said the program, launched in partnership with the SETI Institute, would “increase public awareness of the important questions that need to be addressed” as commercial space travel increases. 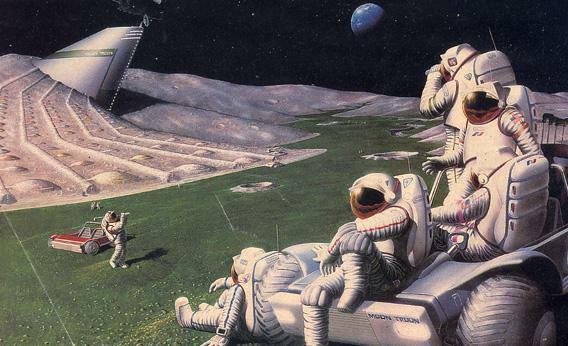 “We may not answer these questions today or even this year, but one thing is clear: We won’t be using cash in space.” John Spencer of the Space Tourism Society predicted that the first “space hotels” will open up shop within the next decade, and will need a payments system. “Once you’re up there, if you want to buy an extra bottle of champagne, they can probably run that on your charge card,” Smith said. But longer stays in orbit, and the colonization of new planets, will make that more difficult. Eventually, he said — maybe 20 years from now — new solutions will need to emerge. Space tourism is already happening on a small scale, with Space Adventures leading wealthy private citizens on trips to the International Space Station, and Richard Branson’s Virgin Galactic getting into the game. But the real money in the next couple of decades could be in deep-space mining, where startups like Planetary Resources and Deep Space Industries are looking to drill into asteroids for precious metals and other booty. If this is indeed the beginning of a new gold rush—or platinum rush—it makes sense that PayPal, a company co-founded by SpaceX’s Elon Musk, would be there to capitalize. It’s a big universe, but when it comes to the people with the means and vision to explore it, it’s actually a pretty small world.